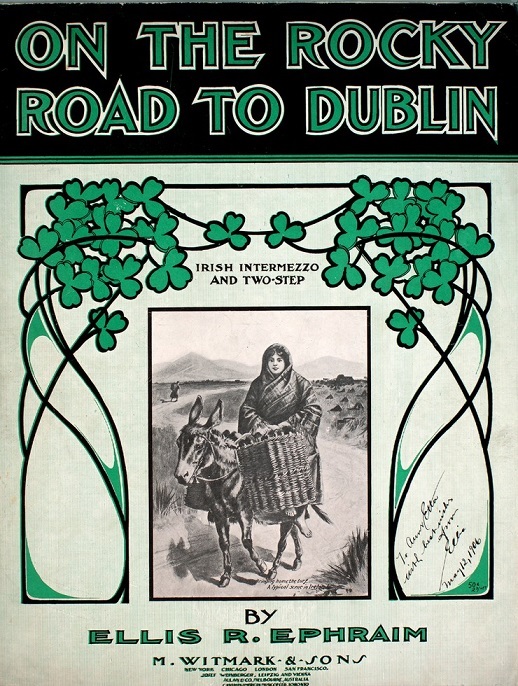 The Rocky Road To Dublin, The Dubliners Lyrics And Guitar Chords, Written By D K. Gavan from Galway and first recorded in 1915 . made popular by Harry Clifton in the music hall days around London. Best version so far by Luke Kelly and The Dubliners. Recently recorded by Celtic Thunder. Till I was almost tired of the rocky road to Dublin. Wasn't much in vogue on the rocky road to Dublin. Or better far, instead, on the rocky road to Dublin. We quickly cleared the way, for the rocky road to Dublin. There's a new song out for the european championship by The Dubliners with Damien Dempsey doing the singing. The title of the song is The Rocky Road To Poland. It uses the same tune as this song just a few different words. So if your playing the new one then use the chords given here. lovengly against the musical line in a spine tingling blend. Here's the 2 missing verses that The Dubliners never sang and forms part of the original song. The reason songs get cut is generally because the are too long. These belong after the second and forth verses. Was too much for my ha'pence. Be dad! says I, I'll walk it! full of cars for jaunting,. I'll drive you, at your leisure. And the berries won't be troubling. On the rocky road to Dublin! The beginning point of any Dubliners biography is always Merrion Row (or Baggot Street, depending on who you ask. As you might expect, the Dubliners started out in the back room of a pub. A few years earlier, Ronnie Drew had emigrated to Spain travelling, teaching English and playing his guitar. Upon returning to Dublin, Ronnie made friends with John Molloy, a renowned local actor, and joined him in a number of stage ventures. One of these ideas for a stage show involved collecting traditional Irish ballads. Drew decided that recruiting some additional musicians to form a group would be a good idea and he knew just where to find them - in the pub! Experienced folk singer Luke Kelly had just returned from travelling the folk clubs of Britain and regularly visited O'Donoghue's pub, as did tenor banjo wizard Barney McKenna and guitarist and whistle player Ciaran Bourke. Along with Ronnie's deep, gravelly tones, they formed the Ronnie Drew Ballad Group, playing a series of concerts at the Grafton Cinema, the Abbey Tavern and the Royal Hotel. As their fame spread around the area, Ronnie Drew voiced his dislike at being the only named 'frontman' of the band so, at Luke Kelly's suggestion, they named themselves after James Joyce's novel The Dubliners. In 1963 the band invaded the United Kingdom, packing their beards and instruments and hitting the Edinburgh Folk Festival, getting themselves onto the Hootenanny compilation recorded at the festival in the process. On hearing them, the head of Transatlantic Records was impressed enough to sign them to his label, allowing them to record and release their eponymous first album and a single, The Rocky Road to Dublin. Luke Kelly took a sabbatical from the band at around this point, continuing his previous solo career in England. The Dubliners' big success came in 1967. Popular pirate radio station Radio Caroline put their recording of traditional comic drinking song Seven Drunken Nights on the playlists. Although, as Ronnie Drew is heard to remark on many recordings, 'There are seven verses, but we're only allowed to sing you five of them' (the last two having been banned for being a little bit too saucy for public broadcasting), the song was a big hit, selling 40,000 copies in the first two days of release and reaching number five in the charts. In an era divided between sharply-dressed crooners and psychedelic tie-dyed flower people, a rowdy bunch of scruffy Irishmen belting out a bawdy drinking song had caught the public's attention. This set the stage for the Dubliners' career. A skilled bunch of musicians and singers (all of whom contribute vocals at one time or another, justifying the renaming from The Ronnie Drew Group), the Dubliners are more than capable of tackling heartfelt ballads such as A Parcel of Rogues or The Leaving of Liverpool. However, the band are always at their best, even now as the old statesmen of folk, launching into their huge repertoire of comedic drinking songs such as Seven Drunken Nights, A Pub With No beer and All For Me grog, or their vignettes of Ireland in the early 20th Century such as Dr Johnson's Motor Car and The Black Velvet Band. Between 1961 and today, the number of bands to have formed, made records and then split is almost countless, but although musicians have left, been replaced and returned several times, the Dubliners are still around .One testament to the love of the band for their music is their determinedness to battle on against adversity. After suffering a brain hemorrhage in 1974, Ciaran Bourke returned to the band and played on until his death (aged 53) in 1987. Similarly, Luke Kelly returned to tour with the band from 1982 until his death in 1984. Thankfully, there's always a pool of talented singers and instrumentalists willing to join such a renowned band. Today Sean Cannon, Eamonn Campbell Patsy Watchorn and Barney McKenna complete the Dubliners line-up, still touring the world and drawing the crowds. As anyone who has heard the fantastic 1987 single The Irish Rover with The Pogues will testify, they can still cut it with the young upstarts..All the songs here have easy chords that can be played by a novice guitar player. As you know Barney, Luke and Ronnie and Ciaran are no longer around but their songs live on through The Dublin Legends with Gerry O'Connor taking Barney's place on Banjo. The above photo. is a sleeve of The Rocky Road To Dublin that was published in New York in 1906 with the composer credited as being Ellis R. Ephraim..